Looking Back: A Pickering Connection to the Underground Railroad? Home » News » Looking Back: A Pickering Connection to the Underground Railroad? With the recent news of asylum seekers crossing the border into Canada, we are reminded that Canadians have a long history of accepting people seeking refuge. Between 1840 and 1860 runaway slaves from America also crossed over the border looking for a safe place to call home. Travelling on the Underground Railroad (UGR) was a secretive and dangerous venture and often the names of those former slaves were never recorded on arrival in Canada. A recent archaeological excavation completed by Toronto and Region Conservation Authority (TRCA) at the Haight site in Pickering seems to have identified one such person. 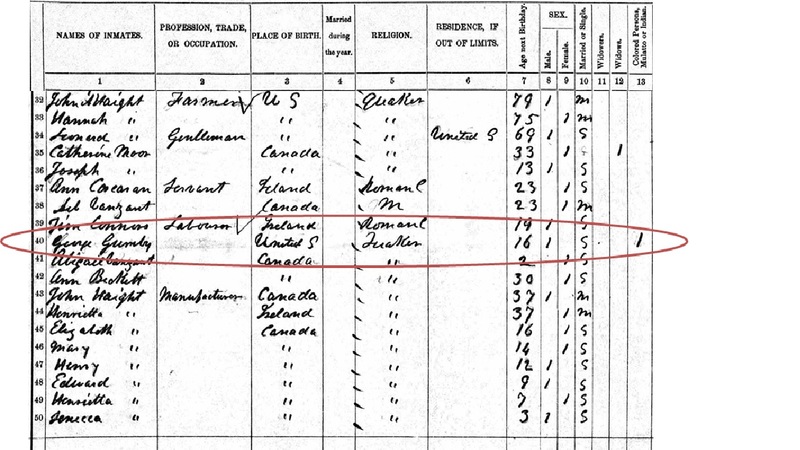 A review of the Haight family in the 1861 census identifies a teenager by the name of George Gumby residing in their home. George is listed as a 16 year old colored man born in the United States. While the Haight’s employed four people of Irish descent as servants or labourers, George was neither. Instead, he is listed as a student. In 1861, John Haight and his wife Hannah were grandparents in their 70s living within walking distance of their children and grandchildren. It makes one wonder why this teenager was living with the elderly Haight’s and how he came to be there. One explanation may be that George crossed over the border seeking asylum and was taken in by the Haight’s. John Haight and his wife Hannah were Quakers originally from the United States who joined the Society of Friends settlement in Pickering Township around 1811. While Canadian Quakers had no formal position on abolition, the American Quakers denounced slavery and were a confirmed antislavery organization. In addition, there is evidence that the UGR may have originated with the Quakers in Pennsylvania. It is possible that George Gumby was a runaway slave, or perhaps free born fleeing the United States after the 1850 Fugitive Slave Act was passed, who followed the UGR, and eventually found refuge with the Haight family through the Quaker network. Though there are no formal links between the Pickering Quakers and the UGR, a strong network was paramount for the successful operation of safe houses and the Quaker network was very strong between settlements in Pickering, Niagara, Newmarket and the Bay of Quinte. Established links to Niagara in particular would have benefited fugitive slaves who crossed at the Niagara River. In 1871, the Pickering census identifies a ‘George Gumbey’ who is employed as a coachman. No additional census records, marriage or death records appear in Canada or the U.S. for George. We may never know for certain if he moved away from Pickering, returned to the United States or moved elsewhere after 1871.